We called this van our Platinum van because it’s our most luxurious! With portable toilet and shower included, customers who hire this van are usually couples. 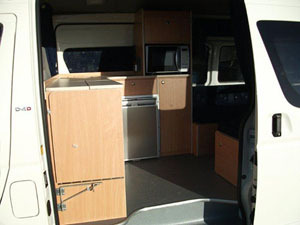 The van is very easy to drive, with a compact design, yet impressively spacious inside. Transports 2 people in comfort… very spacious van. Heaps of room to move in a compact vehicle. Very easy to drive. Huge bed. High-quality fittings. TV/DVD. 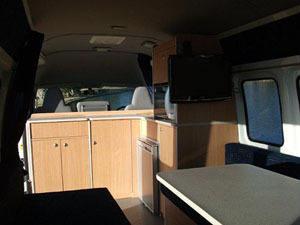 Air-conditioned living area, portable toilet, plus shower. 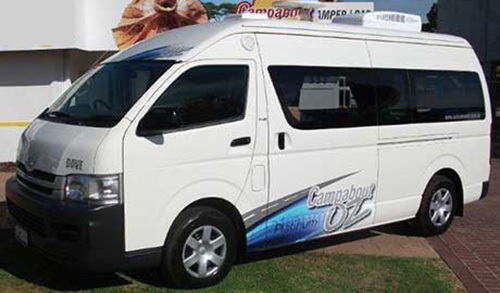 You’ll love this impressively equipped van – we’ve thought of everything. Beds 1 x very large, comfortable double-bed. 2.0m x 1.75m extra thick foam. Sleeping FREE tent/sleeping gear supplied if required when 3 people are travelling. 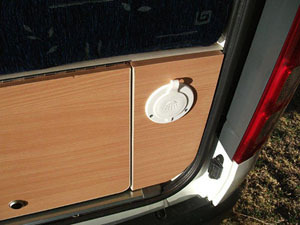 External Powered Shower at Rear of Van… shower cubicle supplied! 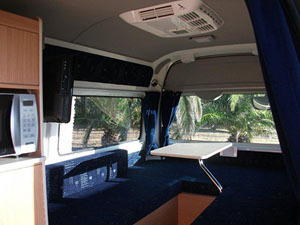 Airconditioning in driver cabin plus 220v airconditioning unit in sleeping area. 12v TV/DVD Player in rear.